Security is one of the top criteria of subscriber and enterprise for choosing service providers. Unsecured devices put network assets at risk, and dissatisfied subscribers can damage a trusted, valuable brand and reputation. Infoblox Secure DNS Caching provides highly cost-efficient control, improved subscriber experience, and deep protection from a wide range of DNS attacks and malicious domains. Secure DNS Caching protects subscribers from growing malware threats, service disruption, and slow response through use of global threat intelligence and automated protection packages. The solution maintains critical DNS service availability in rapidly evolving networks, growing traffic, and even during a malicious DDoS attack. The advanced caching functions ensure that the best and most used responses are always available for subscribers. DNS Firewall keeps subscribers safe and reinforces brand integrity. Infoblox DNS Firewall protects against advanced persistent threats and malware by identifying infected devices and preventing them from accessing known malicious domains. 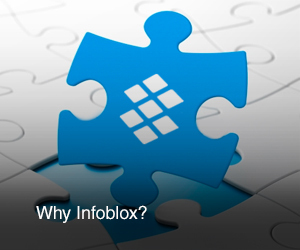 If subscriber, application or device attempts to access a malicious domain – Infoblox prevents the DNS query from resolving, access is essentially blocked and presented with an operator-designed notification screen or re-directed to an alternative site. Operators retain maximum flexibility and can include local, operator-specific threat feeds and customized whitelists or blacklists as desired to prevent erroneous blocking. Service degradations and outages are a significant cause of subscriber dissatisfaction and churn. Denial of service (DoS) attacks and volumetric floods or distributed denial of service attacks (DDoS) targeting DNS network infrastructure can cause service degradation, slow DNS response, or impede subscriber ability to access favorite domains. Advanced DNS Protection for Service Providers maintains service availability, critical DNS functionality, and performance during a volumetric DDoS attack or unexpected traffic spikes generated by rapidly evolving networks, misconfigured devices, or applications, emergency situations, and network outages. Excessive network delay or latency can have a profound effect on subscriber experience where both enterprise and subscribers expect network response will be close to instantaneous. Response delays have been shown to negatively impact revenue for service provider’s important enterprise customers. Slow-responding legacy DNS cache servers can contribute significant latency to a network connection. Infoblox high-performance caching for service providers sustains sub-millisecond latency, provides fast response to queries and maintains service availability. Infoblox DNSSEC easy validation provides subscribers with secure application performance with no impact to application latency or degraded subscriber experience. It helps protect the Domain Name System (DNS) against so-called “cache poisoning” or “man-in-the-middle” attacks by allowing DNS data to be digitally signed and authenticated.